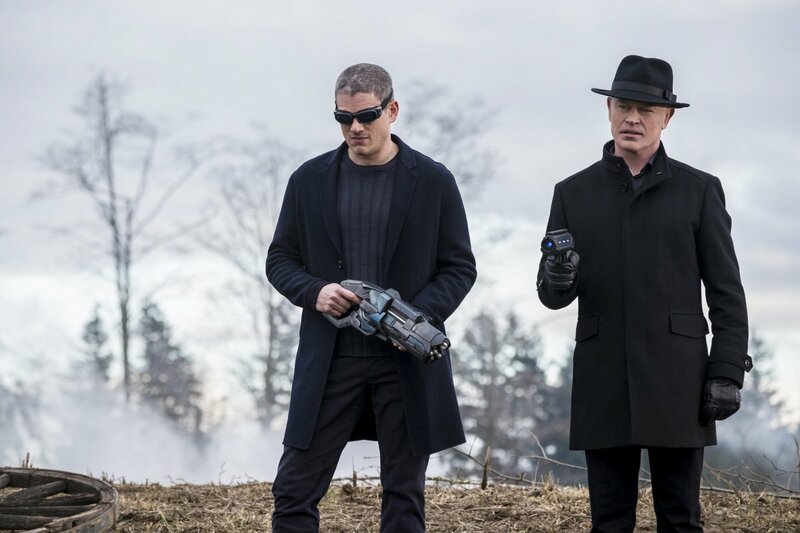 The CW has released a new batch of images from the March 21st episode of Legends of Tomorrow and they feature a first look at the shocking return of Wentworth Miller’s Captain Cold. The method of his resurrection isn’t clear, but fans will no doubt be very happy to see the villain back amongst the living. When we last saw Captain Cold, he sacrificed himself to save the team and time in general, a heroic ending for this member of the Flash’s rogues gallery. Since then, the prospect of a return has been teased but was quickly dropped earlier in Legends of Tomorrow‘s second season when Mick abruptly stopped seeing his old partner in what we later learned were time travel related hallucinations (it’s all very complicated). His return here could have something do to with that, though considering the fact Damien Darhk has been plucked from the timeline before his death at the hands of the Green Arrow, this may just be an earlier version of Cold. he Legends must devise a plan to retrieve the last remaining fragments of the Spear of Destiny from the Legion of Doom. They find themselves in France at the height of World War I faced with the knowledge that they must destroy the mystical object. They enlist the help of a soldier by the name of John Ronald Reuel Tolkin (guest star Jack Turner) and find that the Spear is leading them into the heart of the war. Meanwhile, the team must all resist the temptation of the Spear, and the return of a former teammate. It’s going to be really interesting seeing how Captain Cold manages to come back here, but the fact the Spear of Destiny is now so close to being in the hands of the Legion of Doom looks to be the bigger concern for the team. Expect more about this episode of Legends of Tomorrow to arise over the next few days, so be sure to stay tuned.